The Royal Botanic Garden in Australia’s most visited city is no secret. Last year alone, 13 million domestic and international visitors trampled its green 74-acre surface. The popularity of this showcase harborside garden is hardly surprising. It affords priceless views encompassing both the Sydney Opera House and the Harbour Bridge. But the garden offers more than a spectacular vista. A casual wander away from its crowded harborfront path into its heart can draw the visitor into an experience both personal and surprising. Palm House nestles in a little-noticed spot in the garden’s quiet upper section. 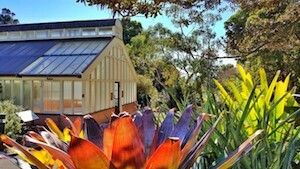 An unassuming yet attractive glasshouse, it was originally built in 1876 as the first of its kind in New South Wales. Dominated by a giant native fig tree and lacking the visual hit of a nearby multi-colored bed of bromeliads, this modest building, now used for functions and exhibitions, is more stumbled upon than sought after. Yet missing it could mean missing an unexpected personal opportunity. Marijke Gilchrist is no ordinary painter. She is an encaustic painter. The encaustic medium has been known since ancient times but is rarely encountered today, despite the special qualities it brings to paintings. Like commonly-used shellac (also present in Marijke’s paintings), encaustic is derived from the natural products of an insect. Shellac is derived from the protective tube secreted by the female lac bug to protect her eggs, while encaustic is a fusion of molten beeswax, natural resin, and pigments. Applied in layers to construct a painting, encaustic creates an impression of extra depth: the viewer can almost feel the sticky wetness of foam blowing off an ocean wave. Not only that, the medium has unique sealant qualities that make paintings impervious to moisture and degradation. This self-preserving quality means that Marijke’s paintings, vivid, authentic, and attractive to the eye as they are, can also be felt — literally. The artist actively encourages visitors to touch her work. It is a rare, almost guilty pleasure to touch a painting, and stroking the silky smooth, gently undulating encaustic surface proves a strangely sensuous experience. As an immigrant, Marijke arrived in Australia from Holland as a child with her parents in 1951 and has traveled extensively in her adopted continent. Entirely self-taught, Marijke brings to life remote coastlines as well as vistas of the dusty 1,150-mile-long Canning Stock Route in Western Australia. “As a child from Holland arriving in this strange new place,” she says, “I was amazed by the intensity of the light. 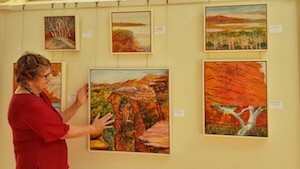 The bright colors.” Her paintings celebrate it all, from rocky outcrops glowing red in the intense outback sunlight to the vibrant blues and whites of a churning seascape to the misty green of a waterhole deep in a gorge. Marijke’s paintings, like all exhibitions in the Palm House, are displayed for a limited period. But who knows what surprise might await the next visitor? Anyone willing to explore off the beaten path in Sydney’s Botanic Garden has a fair chance of finding out. Marijke Gilchrist’s website can be found at www.fromthehive.com.au.